As had been rumoured over the last few days, Joachim Low played a 4-3-3 system rather than the 4-2-3-1 he usually played in qualification, with four centre-backs across the backline and Philipp Lahm playing as the midfield anchorman. It was a curious move, but it worked extremely nicely. With the exception of Benedikt Howedes, who seems very awkward in Germany’s problem position of left-back, everyone played their role well. The most impressive aspect of the performance was the fluidity of the front three. Mesut Ozil started right, Mario Gotze from the left, and Thomas Muller upfront, but they all had license to drift around, and combined superbly. Gotze was the man who put Germany in charge of the game with some excellent contributions from the left, but he also got himself into goalscoring positions, and won the penalty from Joao Pereira for Germany’s first goal. Ozil’s lateral movement is something we’ve come to expect, but Muller also ran the channels excellently, popping up in wide positions to retain the width when Gotze and Ozil moved inside. This was crucial considering the lack of natural overlapping runs from full-back. It’s amazing he managed three goals despite spending so much time towards the flanks. That said, Germany also looked very dangerous down the right, which was highly impressive considering Portugal’s area of strength is their left wing. Jerome Boateng was brave with his positioning, pushing on past Cristiano Ronaldo to provide an outlet on the right. This was a risky move, of course, and Ronaldo stormed forward on a dangerous counter-attack within the five five minutes – Hugo Almeida couldn’t provide a finish. But Germany were always pushing forward down the right, with Sami Khedira sometimes covering for Boateng, but also charging into attack himself, surprising Portugal with his sudden bursts of pace. Although Germany were the better side, Portugal looked dangerous in the first half, and it was only the Pepe red card that handed Germany complete control of this game. 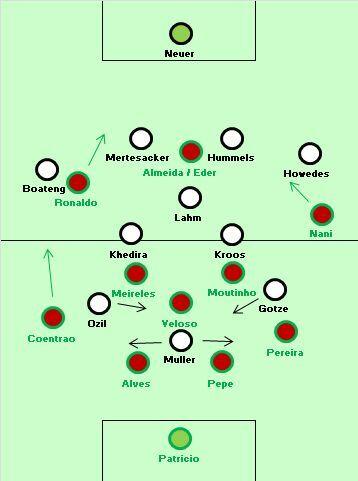 Portugal pressed well in midfield at times, with Miguel Veloso charging forward to shut down Lahm on one occasion (Lahm thought he wouldn’t be shut down considering he had no direct opponent in this 4-3-3 v 4-3-3 battle) and creating a half-chance for Ronaldo. There was a two-minute spell, however, that showed how much Portugal look to Ronaldo. First, Nani charged forward down the right and had the opportunity to dribble directly towards goal, but he hesitated, waited for Ronaldo to catch up on the left, and then played a weak pass which was intercepted. Shortly afterwards, Fabio Coentrao found himself in a goalscoring position having broken the offside trap, but played a wayward square pass in Ronaldo’s general direction, rather than going for goal himself. On both occasions, Portugal needed more conviction rather than simply looking to their man man. This was one of the most open matches of the tournament so far – at least in the first half. Although both sides were playing their best football on the counter-attack, the defensive lines sat deep, and the sides weren’t particularly compact, so there was always midfield space to break into. 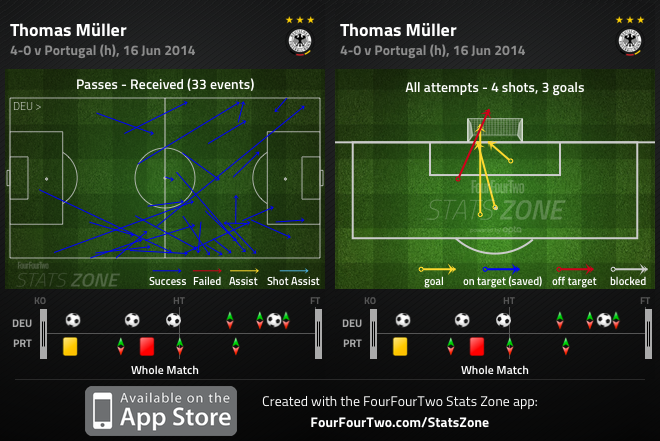 Pepe’s red card, and Muller grabbing a third goal, ended the game before half-time – which was a shame. Of the 16 matches in the first ’round’ of group matches, this was the most likely to be a goalless draw. There was no surprise here – Iran sat very deep and defended, while Nigeria, reliant upon the counter-attack, couldn’t break them down. 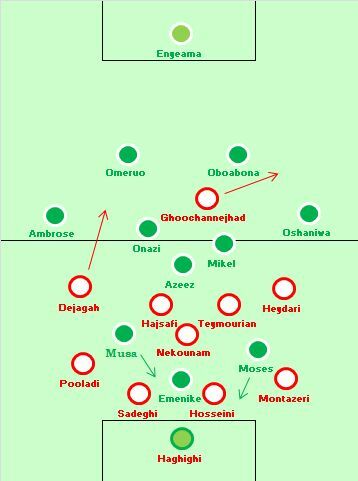 Iran were expected to be very cautious in a 4-4-1-1 shape, but they were actually even more defensive in a 4-5-1, with Ashkan Dejagah playing from the left rather than as a number ten, which meant Reza Ghoochannejhad had little support throughout the game. He made some good runs into the right-hand channel, but mainly just battled with the opposition centre-backs, winning and conceding a very high number of free-kicks. This game was about Nigeria’s inability to break down a solid Iran defence. Often in these situations, the side dominating possession pass too slowly, but actually the tempo was very good – particularly throughout the first half. Nigeria simply lacked genuine creativity in midfield, with only a John Obi Mikel dink over the defence to substitute Peter Odemwingie memorable in terms of creativity. He and Ogenyi Onazi simply couldn’t play penetrative passes. Nigeria’s wide players came inside quickly, and the two full-backs didn’t have enough attacking quality to stretch the play and whip in crosses. Odemwingie, a forward, replaced Azeez to change Nigeria’s shape and offer another goalscoring option, but the reigning African chances didn’t do enough, with their best chances coming from set-pieces. In all, a truly terrible game. Clint Dempsey scored a fine goal inside a minute, and therefore Ghana were immediately forced to dominate in an attempt to score an equaliser. Ghana’s problem over the past half-decade has been their inability to break down a packed defence. They’re excellent on the counter-attack, with fast, mobile players who make good decisions on the break, but this was another example of their one-dimensional play. 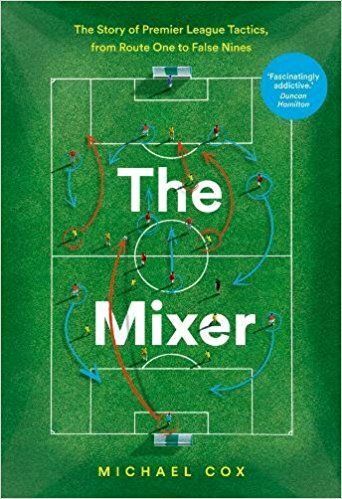 They were always in control of possession but their players simply aren’t suited to coming from behind – they need the opposition to come onto them. Ghana continually looked to work the right of the pitch. Christian Atsu was the liveliest player, always looking to collect possession in wide positions before darting inside, but he frequently took the wrong option. Behind him, Daniel Opare received space in the right-back position with Jermaine Jones playing deep and narrow, but contributed extremely little on the ball, turning in arguably the worst individual performance of this tournament so far – his crossing was shocking. With the Ayew brothers on the periphery of the game and underwhelming when receiving the ball in dangerous positions, Asamoah Gyan was the primary goal threat. Typically, he ran the channels throughout the first half, but the US were comfortable with him moving away from goal, because no-one else was making runs into the centre-forward position. Gyan isn’t really about getting on the end of crosses, but Ghana created genuine chances when he stayed central at the start of the second half, and went close with two good headed chances, after crosses from either flank. 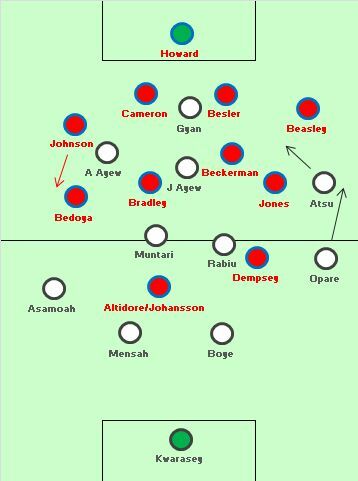 Although Jurgen Klinsmann had switched to a diamond midfield in preparation for this tournament, his side essentially defended with two banks of four without possession, with Michael Bradley dropping back alongside Kyle Beckerman. And because they spent so long without the ball, they were basically a 4-4-2 throughout, with Bradley surprisingly inefficient when he received the ball, not connecting the midfield and attack. The USA were unfortunate to lose Jozy Altidore through injury midway through the first half, and while Aron Johansson ran the channels manfully, he’s not really an Altidore replacement. The USA missed someone who could run in behind the opposition defence, and hold up the ball. They had no-one to relieve the pressure, and therefore were almost constantly stuck on the edge of their own box, soaking up pressure – although, of course, it’s arguable this was the optimum approach against a Ghanaian side depending on the break. Still, even when playing defensively, you still need to have a counter-attacking threat. Bradley and Dempsey were both very quiet, while Alejandro Bedoya, the obvious man to lead the attacking transitions, constantly made the wrong decision. In fact, when Altidore departed midway through the first half, the USA were already under heavy pressure. Klinsmann might have considered bringing on an extra midfielder at this stage, because his side simply weren’t covering the midfield ground effectively. Dempsey and Johansson were stuck upfront with little service, covering the responsibilities of one man, and it felt like the USA were playing with ten players at times. However, Kinsmann was able to depend upon good performances at the back, while Kyle Beckerman was excellent at screening the defence – he protected the ‘red zone’ excellently, meaning Ghana always looked out wide for their route to goal. Tim Howard, meanwhile, claimed crosses well and swept off his line intelligently. Kwesi Appiah made three straight swaps to get back into the game, when he probably could have sacrificed right-back Opare and used a winger there – Ghana’s full-backs weren’t doing defensive work. It was surprising that Ghana’s equaliser came from Andre Ayew from the left – he had been poor, while Ghana were focusing their attacks down the other side. The USA deserve great credit for their performance after Ghana’s equaliser – having spent more than 80 minutes solidly protecting the lead, they were capable of coming forward and playing more proactively. Right-back Fabian Johnson, having lost Ayew for the Ghana goal, seemed determined to make up for his error in an attacking sense and took up very advanced positions when the USA midfield had possession. This was a real risk – Ayew got in behind him dangerously two minutes after the goal – but it had its rewards. Johnson overlapped to force a spell of pressure down the right, and then yet another forward charge resulted in the corner for John Brooks’ headed winner. The statistics sum up his display – just one tackle, no clearances and no interceptions, yet he attempted more dribbles than any other player. Amazingly, Johnson was still bombing up and down the line with the US 2-1 up. He had the energy to sprint into attack, but not to get back into defence. Clearly, by this stage he should have been protecting his his centre-backs – but Ghana never looked likely to launch a second comeback. Can’t say ref was too far wrong to send off Pepe but he could’ve given them both a yellow and moved it along. It was no vicious elbow or cynical tug to a man clean through. Refs in some of the other games have had the opportunity to take the red out and preferred rather to calm things down and restart the excellent football we’ve seen. Shame the ref didn’t take that approach here. Also I agree – Ronaldo is the man man. Iran-Nigeria a “truly terrible game”? This, from the man who named Greece’s 2004 win at the Euros the tenth-greatest tactical achievement of all time? I’m kidding in large part, of course, though I do think it is interesting that Iran have come out making such a defensive statement. It’s always at least interesting to me that a coach can get as much tactical discipline out of a squad as Queiroz did out of his clearly-outclassed Iran, in continuation of their impressive and improbable run to even make the Finals in the first place, which has to be all down to the discipline he introduced. Obviously, unlike that Greece squad, absolutely no provision was made by Queiroz for goals. For one, the fullbacks almost never even ventured into the final third, let alone delivering crosses as you pointed out. Also, I observed as the game progressed that Ghoochannejhad is not quite the class of Cristiano Ronaldo, capable of counterattacking almost all by himself the way Portugal did at the last World Cup. Set pieces didn’t seem particularly dangerous, either, leading me to wonder if the plan for goals is just hoping for luck. Still, a tactically disciplined side is interesting in its own right, in my opinion – it’s probably better appreciated by taking a longer view than just this one game though. And in that respect, I’ll be fascinated to see what Sabella does against a strong, compact squad. When Mourinho’s Chelsea uses such a tactic, it is his master mind. When small teams like Iran do it, it is a terribly bad performance. please quote me where did you read that Iran’s performance was terribly bad. he was talking about the match/game itself, which was “truly terrible”, and let s face it, it was exactly that. The match was terrible and boring. Iran did a great job defending. Nigeria was impotent attacking. 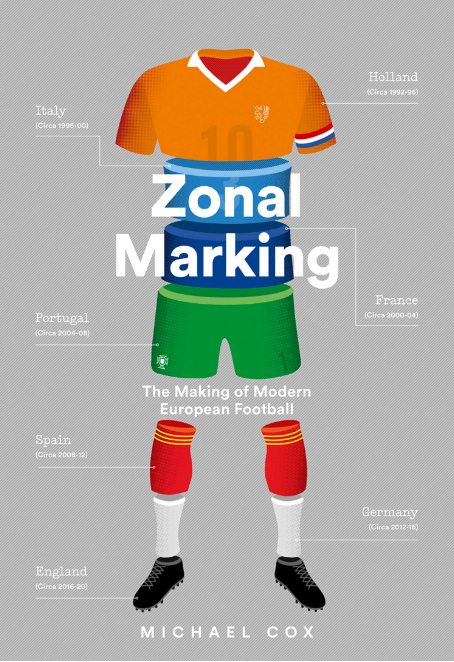 Also, on the topic of USA-Ghana, for all Klinsmann’s talk of “attacking with 11, defending with 11″ and playing “European football,” American fans should not get too many visions of totaalvoetbal dancing through their heads at this point. It seemed to me that the US plans for attacking were built solely around Altidore’s ability to hold up the ball, and when he was lost, so were the US’s plans for goals. After that point, Klinsmann simply parked the bus and decided that the best plan of action was to attempt to defend one goal for more than an hour. Sure, Ghana seemed to have no clue what to do with possession, appearing very much like a group of skilled individuals (including a comically wide bicycle kick from the edge of the area) and not very much like a team (that even describes the goal). But Klinsmann’s decision to go so very defensive so early may bespeak just how important Altidore was to plans – there seems to be not much going on besides. It’s hard to imagine that they could defend as long or as well against Portugal or especially Germany. Any thoughts on how to make the US relevant in their next two games assuming Altidore won’t be there? “Any thoughts on how to make the US relevant in their next two games assuming Altidore won’t be there?”…. ….especially how to defend against Ronaldo? Switch J. Jones to the right of the diamond? (Then who starts on the left?) Start someone else (Chandler) at RB? I would love to read ZM’s thought on this question. How about don’t score so early? Dempsey’s goal happened so quickly that I think the US team just naturally assumed a defensive posture. Hopefully the Portugal game will stay close long enough to see how Klinsmann actually wants to play. I’m not sure it was just Altidore. Dempsey looked distinctly less mobile after getting kicked in the nose, and Bradley having the worst game of his national team career didn’t help. Then throw in what appeared to be multiple hamstring injuries (Besler went off at half, and Bedoya, Jones, and Cameron all limping by early in the second half)… I don’t think any team with this many injuries could attack much at all. I also don’t think it’s a coincidence when multiple players hurt the exact same muscle – something was seriously off about the physical preparation. You’re definitely right about the conditioning. Klinsmann really had them go at it hard in the lead-up to the tournament, including a lot of heavy running drills, which is a lot to ask of a team comprising a number of players who are in the middle of their season. It’s hard to break quickly when you’re afraid of your guys tearing a hamstring. And you’re also right that Bradley was awful. We might give him a bit of a pass and say that after the formation got collapsed back to the two banks of four, he wasn’t playing the position for which he prepared in this tournament. For whatever reason, he looked completely out of ideas, but he looked much better than that in the friendlies, so let’s hope we can put it down to just a bad game. Let’s also hope that we see a bit more of the use of the diamond to give him a chance to play a bit more creatively. And I would assume that playing with a broken nose seriously hinders your movement and bravery. Ghana “having no clue what to do with possession” had as much to do with the decision to sit deep for the US as anything. Klinsmann wants to play proactively but this is a World Cup and Klinsmann isn’t stupid. Even before the lineup was announced you knew that Ghana wanted to get into an open, end to end game because they are best countering with speed. That became doubly apparent once the Ghana lineup was announced. It may seem paradoxical but sitting deep against a team that wants an open game is a way of dictating the game to your opponent, which is another of Klinsmann’s mantras. The US’s tactical plan was always going to play cautiously to avoid getting into a track meet with a team that would have shredded them to pieces in that kind of game. It was an incredible stroke of fortune that they found a goal so early, but I expected that they would have only been slightly more adventurous had they not. It is very interesting to see such a stark contrast in the assessment of Jermaine Jones’ performance. You said he put in one of the worst individual performances of the tournament while many here, stateside, had him as the MOTM for his industrious work in defense. It epitomizes the fact that it was an ugly win for the US. I believe he’s referring to Daniel Opare there, not Jermaine Jones. An ugly win nonetheless. He was referring to Daniel Opare turning in one of the worst performances, not Jermaine Jones. Jones was pretty universally applauded as turning in a MOTM performance yesterday. Duly noted. Thanks. Kicker gave Jones and Beckerman 4s (below average) though. Not sure I agree with those ratings. Beckerman wasn’t spectacular in the sense that you heard his name called a lot, but his positioning was spectacular as always. He knows the exact right situation to press, slow down the opponent, and angle them in to support. Jones was everywhere last night, not sure how you can watch the game and not have him as one of the top performers on the night. He was far from below average. A particular sign of alarm I got from the Portuguese team was the midfield performance in which Meireles didn’t seem able to cover much ground (he looks out of form), and Moutinho was extremely quiet. Once we (Portugal) got forced to playing proactively by being 1 goal down, you’d expect the midfield to link defence to attack,led by Moutinho, but instead we were constantly attacking down the right flank with Nani dropping deep to start moves and linking up with Pereira. Interestingly ZM seems to attribute the huge spaces in midfield not to poor work by the 3 Portuguese midfielders necessarily, but to our deep defensive line. You’d wonder why play so deep after we went a goal down. I had a sneaking suspicion that Veloso would start this match over Carvalho due to his ability to make excellent sweeping long passes for Ronaldo to counter, but obviously the game plan went out of the window early on. I expect Carvalho to start the other 2 group matches. Coentrão missing to injury is going to be a massive blow with no adequate replacement and him being one of our most creative players. On an entirely different point, I think Germany and some other teams with unconvincing fullbacks or even playing narrow formations/lone wing-backs, are getting away with it due to the extreme heat. Typically teams like this get overrun down the wings by rampant overlapping fullbacks combining with wingers (which is why 3-5-2 is no longer a dominant formation), but in these conditions it’s very hard for fullbacks to bomb forward and track back all day long. I think we’re seeing a mini-resurgance of defensive fullbacks for this competition, and I suspect Belgium who has a similar setup might not struggle as much with it as expected. I might be oversimplifying that point a bit as some fullbacks have been important like Rodriguez of Switzerland and Aurier of Ivory Coast, but still, so far it’s not exactly been a competition dominated by 4-3-3s and 4-2-3-1s with attacking fullbacks like usual modern football, and I think the reason is rooted in the weather. I think you’re spot on. The rennaisance of the defensive fullback / the 3-5-2 is at least partly due to the climatical conditions. Löw himself explicitly justified the inclusion of four centrebacks by reference to the climatic conditions on German Tv. Generally, he has adapted his tactical approach a lot: the use of Lahm behind Kroos and Khedira allows to keep the ball for long spells of time and safe energy. Furthermore it enables the team to stay compact and defend deep. In reply to critics, which want Germany to emulate the pressing game of Dortmund and Bayern, Löw predicted that the teams, which stick to their usual “European approach” will be out after the quarterfinals. You just might be right, although Italy’s performance against England suggests attacking fullbacks can make a contribution. then again maybe not, the absence of a fullback who’d run on gave Rooney the space to make the cross for Sturridges goal. @ Chris A.: I think that sentence has gotten away from ZM — it was Opare who he meant had one of the worst individual performances of the tournament, not Jones. Also, I thought it was weird how we (Portugal) attacked mostly down the right not the Coentrão/Ronaldo left flank. Think Germany did an excellent job killing off passing routes into the left and purposely cornered us down the right. Or maybe it was partially intentional by ourselves to get Ronaldo involved higher up at the end of moves, not at the start of playmaking, but he was unusually quiet as in too few balls seemed to reach his path (despite players looking extremely over-eager to feed him once we got near the area). how come nani and ronaldo are abysmal . for those two were the only bright spark in the hopeless portugal . now i do agree with your heading that protugal were hopeless in their midfield and really dont understand as to what he was trying to do . if you are to play meireles as defensive midfielder then why dont play a pure defensive midfielder in william than meireles. now when you look at the german formation they were going to have no. of options in the midfield and they had midfield runners to go beyond the back four . why dont you try to match that play ronaldo alone upfront and play another midfielder in the middle . crosses were never going to trouble portugal but with inadequate no. in the middle they were getting carved out right through the middle . secondly other than ronaldo i dont think almeida was ever going to trouble hummels and co . it would had been better for almeida or ronaldo to make channel runs behind howdes but it would had been better to test mertesacker than hummels and try to open germany deeper than throwing crosses . i think portugal will bounce back in the next round but the offense does needs a bit of refinement and thinking . For as resounding a 4-0 win is, I think Germany were on the receiving end of a lot of, for lack of a better word, fortune. Before the sending off Portugal were threatening, but their lack of follow through was more so them shooting themselves in the foot than Germany shutting them down. I can remember a few incidents but near the beginning there was a break where Ronaldo could have been played into space but instead Almeida ignored him and tried to barrel through and ultimately lost possession. There were also countless Nani moments (who else!?) where he was worse than useless, most notably stealing the ball from Coentrao in the box. I know this is cliche but all else being equal, if Portugal were just a little bit crisper, or even luckier this game would have been very different. That being said with the way things did happen to play out I think Germany fully deserved the 4 goals, (maybe not the clean sheet though because they really took Eder out in the box near the end). Muller – the most under rated to have played football the last decade. I have been following this young fella since an European championship for under 19 or under 21 or under some age, I do not remember and some of the current German team (Ozil and the main keeper) was in that competition with Muller being the star player. While I agree that he’s still being underrated despite all of his titles and achievements, he was not part of that youth side. They won the U21 European Championship in 2009 and Mueller was called for the U21 team for the first time only later that year. Holland smashing Spain in a 3-5-2, Mexico holding Brazil in the same system, Argentina failing abjectly to make it work and switching to an uber Dutch 4-3-3 and now the bloody Germans playing 4-3-3 too! Italy showing a Christmas Tree can dominate 4-2-3-1 in midfield and get width if you isolate the opposition fullback by pushing your fullback up and getting the inside forwards to work with them. I hope we’re about to enter an era of tactical diversity again. Fabio Capello got a draw in his opening game having conceded a goal from a keeper’s error. At least that hasn’t changed since 2010! Some interesting games in this round of matches, with good lessons learnt about the teams. Germany – Ozil managed to play a very direct game, in complete contrast to his usual performances. With Reus missing, Ozil seemed to push the team forward, continuously running in behind into the space created by Muller. This created a great front three, with Muller playing as a false nine, Ozil breaking into space and Gotze drifting inside into the hole to create moves. I’m sceptic whether Ozil can replicate this performance against more aggressive defences however, as he lacks the outright pace and goal threat. Portugal – The whole team seemed to lack any confidence in their play. You get the impression they don’t think they can win this world cup and concentrate their play too much on Ronaldo. This is a shame as they actually have some talented players in midfield and defence. They sat back for a lot of this game, but look a much better team when they press forward with a mobile defence and aggressive midfield. Against a Germany team that lacks outright pace in attack, its a shame they didn’t play a high line. A lot of improvement is needed and the missing Pele will be hard to replace in the next two games. 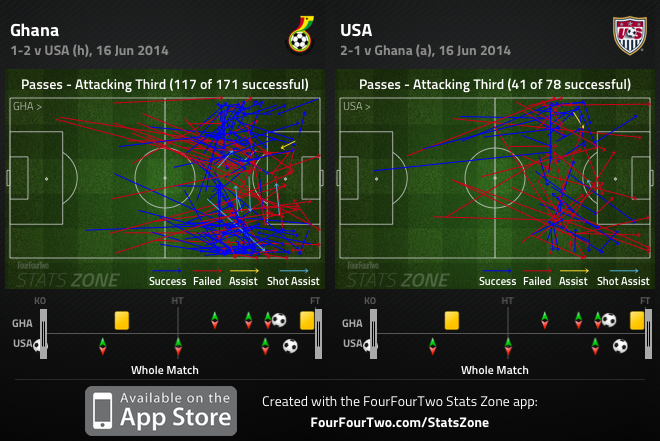 Ghana – Actually showed some promise I thought in trying to break down the USA. They had a few really good chances created from good moves, the only thing missing was clinical finishing (mixed with a strong performance from Howard). Their forwards combined well, but they lacked any invention or attacking quality from deep positions with Rabui very conservative in his play. I was expecting more from Asamoah at LB, he is still one of the most creative players in this squad and was left with a lot of space in his position. Much like Blind did for Holland, Asamoah could have utilised this space to create moves from deep for Ghana. USA – Gave a great defensive performance, especially Howard, and look like a team that believes in what their coach is trying to do. But they will need to drastically improve to escape this group as they lacked any real invention from midfield and won’t be able to drop so deep against better teams who will be much more clinical than this Ghana side. They were fortunate to go ahead so early and will need to have a much more consistent attacking plan against Germany and Portugal. I think the US wanted to back off and invite the crosses to a certain extent. Cameron and Besler are very comfortable facing crosses and Tim Howard is in the best form of his life coming off the line to collect any errant aerial threat from wide. The US is really hurt without Jozy and while some may say that they should have brought Donovan the real miss will be Boyd. I’m really not sure what USA can do as Jozy and Bradley are the only 2 players who don’t have a serviceable replacement. Lastly Beckerman was absolutely fantastic anchoring the defense. A DM with the calm demeanor and superb conditioning is invaluable in the modern game. England’s lack of a DM will sink them this world cup as Gerrard doesn’t have the positional sense or sensibility to frustrate and turn attacks or drop back when a side is overloaded freeing up a CB to help. England is too Mich like Liverpool at the back and if they could score like them it wouldn’t be as big of a problem. Portugal were just weird. i’m NOT a ronaldo hater, i like him, but my god, in that first half they just seemed to be on a mission to tee him up rather than do whats best when they were in good positions themselves. CR looked like he was trying to shoot from 40 yds all the time. it got slightly better in the 2nd half, he did try and play others through. as for Muller… just looked up his stats.. 20 in 50…, of those 8 are w cup goals in probably about the same number of games ( less if anything ) so rest of time he’s got a poor ratio ..something like 12 in 43 .. ok he’s not an out and out striker but i’m already hearing stupid comparisons from part time footie fans ( who don’t bother to research anything ) to gerd muller…good god..that guy was brilliant for club and country. weird how germany keep finding these guys…Klose’s club career doesn’t sit very well alongside his international & world cup feats. I’m a little amazed by how little credit Jerome Boateng still has in the English press. The guy is a serial winner as a starter with his club, is both naturally and technically gifted and on top of that, a pretty decent passer. Is there even a player in World football that has done a better job on Ronaldo in recent years than him? And yet all I hear is ‘Germany are vulnerable in full-back positions’. Is that really all down to one ill-fated, injury-ridden season at City? There is. Philipp Lahm. That guy was needed in midfield, though. Lukas Piszczek on several occasions. I think Boateng is a great defender but he can lack in concentration at times and be a bit unmotivated. He is they guy who needs “man management” a lot i guess. That’s exactly my point: that hasn’t been true for years. He makes mistakes but so does Thiago Silva. He’s a very reliable defender at this point, ppl still see him as the kid in his early 20s that got sent off on his Germany debut. And while I agree that Piszczek usually does a good job, CR7 has a pretty decent scoring record with BVB.